The recording was made in the church of St.Mary the Virgin, Platt, near Sevenoaks, Kent over two days in June and September 2012. This is the first recording the choir has made since 2002 when the spacious acoustic of the church of S. Francisco in Montone in Italy was the setting. 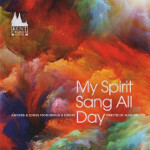 The CD contains 20 songs, from Thomas Tallis to Eric Whitacre. Short clips from each song can be listened to from the links below, which will give an idea of the quality of the singing and the recording.